We Talk to a Brown Bag | Does This Font Make Me Look Fat? 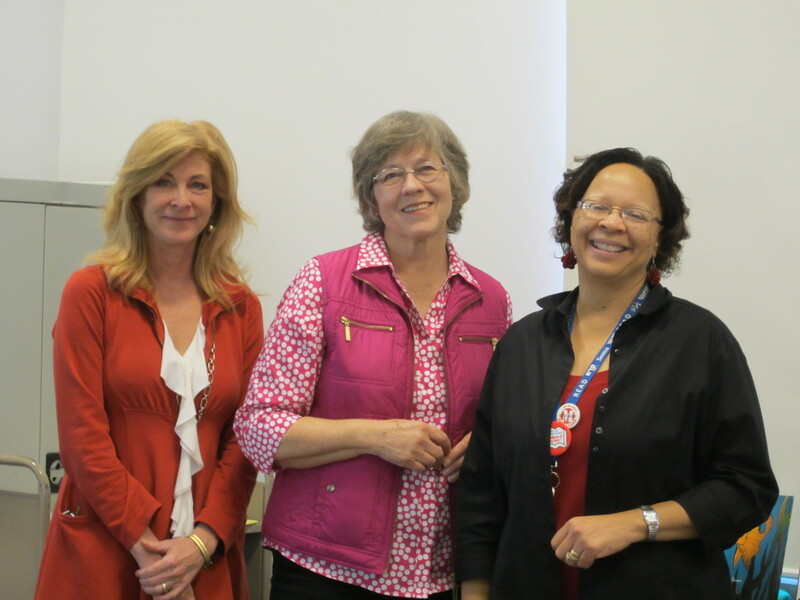 Last week Laura and I gave a talk at a brown bag lunch at the St. Michaels, Maryland library, a branch of the Talbot County library. 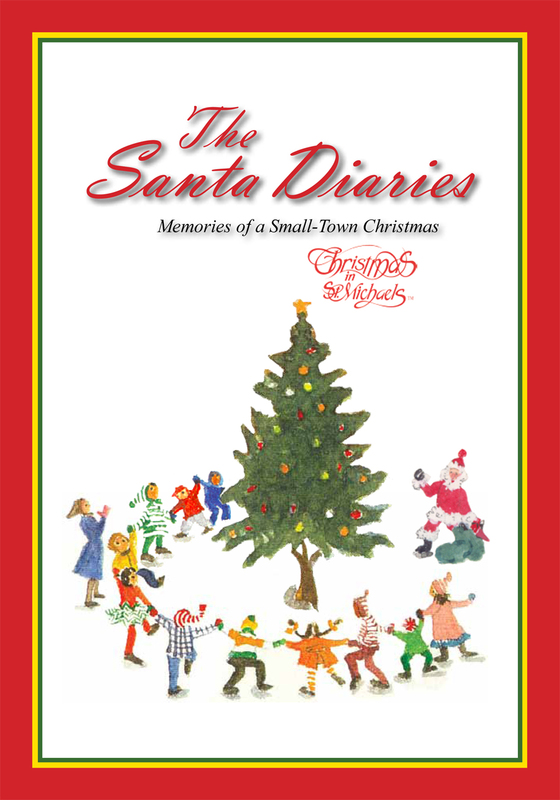 We had been asked several months before to speak about how our book, The Santa Diaries: Memories of a Small-town Christmas, had been turned into a play and then a screenplay. Usually these talks seem like a good idea at the time we’re asked, but the week before we always wonder if we were nuts to agree. This talk, however, was different. Preparing our notes helped us remember the writing path we’ve been on for the last couple of years. All things Christmas. And we loved sharing the story of this writing journey which has been full of creativity, occasional angst, and a lot of joy. We put together photos and slides of the journey and Shauna Beulah, the librarian, managed the computer for us, making sure the right ones got on the screen at the right time. We even were able to play The Santa Diaries trailer that Laura made on Animoto. It always makes me tear up. The brown bags are held once a month and usually feature a local topic. It might be local history, an environmental issue, blue crab recipes, and the occasional author. This is Laura, me, and Shauna. The library takes good care of the people who show up. 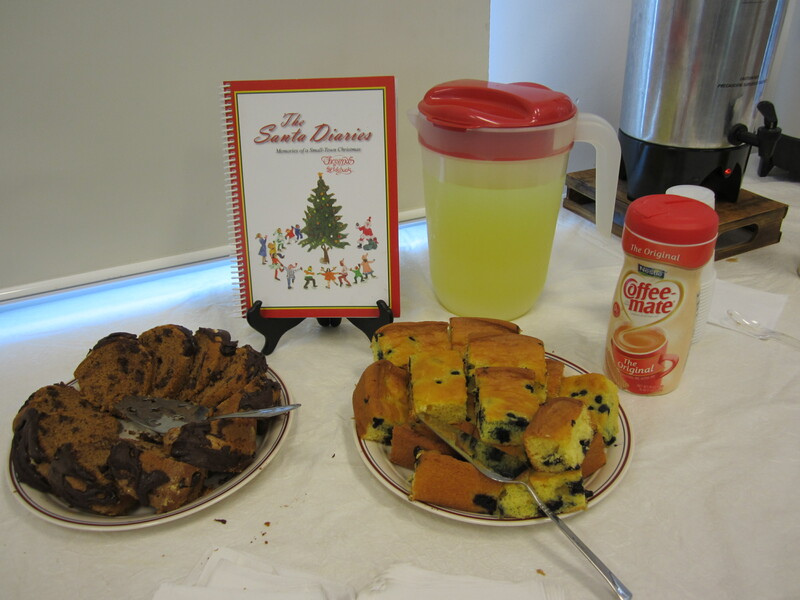 I didn’t see anybody with a brown bag lunch, but there was coffee, tea and somebody had baked goodies. The St. Michaels branch of the Talbot County Library system is my local library. They take good care of us. There were thirty copies left of The Santa Diaries book that we did for Christmas in St. Michaels. Once they are gone, there will be no more. I sold 13 of those 30 copies at this talk. All the monies go to the charities supported by Christmas in St. Michaels. Now I am shamelessly carrying the last few with me everywhere I go. We had a great time remembering the writing work we’ve done the last few years and sharing the journey. No angst. Just joy! This entry was posted in Christmas, Laura Ambler, Mala Burt, Memoir, Script Writing, The Santa Diaries Play, Uncategorized, Writing and tagged Christmas in St. Michaels, St. Michaels MD, Talbot County Libraries, The Santa Diaries, The Santa Diaries play by Mala Burt. Bookmark the permalink.